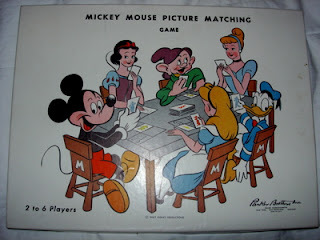 This is the "Mickey Mouse Picture Matching Game" from Parker Brothers. This game is from 1953. My Mom gave it to me a few years back...I don't know where she got it from, but it is in great condition, and has all of the game pieces and the instructions intact. I keep it because it's pretty cool artwork, instead of trying to use it. 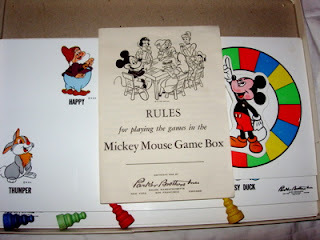 Note: this game board is 2 years older than Disneyland! This game features lots of Disney characters: Mickey Mouse, of course, Cinderella, Daisy Duck, Thumper, Dopey, and more.